We’ve known there was a new Gears of War coming for a while now, and it’s Gears 4. The game is coming “holiday” 2016. 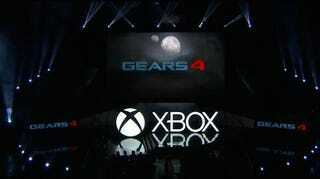 On stage, Microsoft called it Gears 4, but in the official press release, it’s Gears of War 4. The short demo featured two characters—one man, one woman—working their way through a destroyed mansion of sorts. It was dark, disgusting, and eventually an enormous storm broke out.As the two went for cover, they found...bad stuff. They shot it, as one does in Gears of War. When it comes to weapons, they showed off the gnasher shotgun, lancer, and snub pistol. Of course, there’s still a chainsaw for you to rip things apart with. What’s going on? When is this new game set? We don’t know yet.